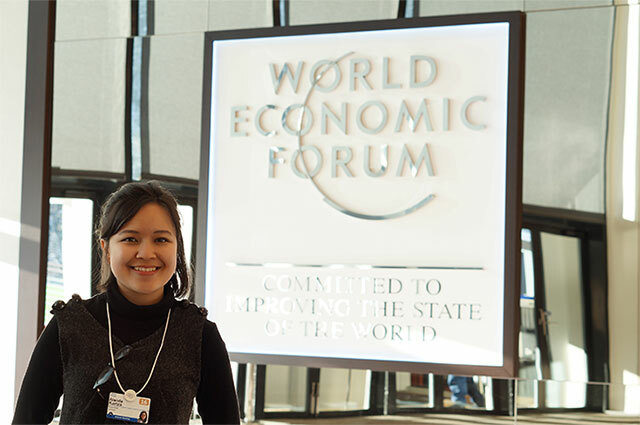 Kariza (25), a graduate of BINUS UNIVERSITY with a degree in International Business, Indonesian activist and professional author, was one of the Indonesian representatives in World Economic Forum held last January in Davos-Klosters, Switzerland. She attended the Forum in her capacity as one of the 50 Global Shapers, a network initiated by the World Economic Forum for exceptional young people making contribution to their communities. Kariza, member of the Global Shapers – Jakarta Hub, initiated Indonesian Youth Conference for young activists of 33 Indonesian provinces to discuss relevant socio-economic problems in their regions. During the Forum, Kariza acted as a panelist in one of the sessions called Culture and the Fourth Industrial Revolution along with the Australian artist, Lynnete Wallworth. In the panel, she shared her belief in the more compassionate world. She thinks the Fourth Industrial Revolution should be able to make people more “human” than we have ever been. Her opinion is also that the rise of virtual reality technologies should empower people to be more empathetic towards different communities.